Figure 15.13. 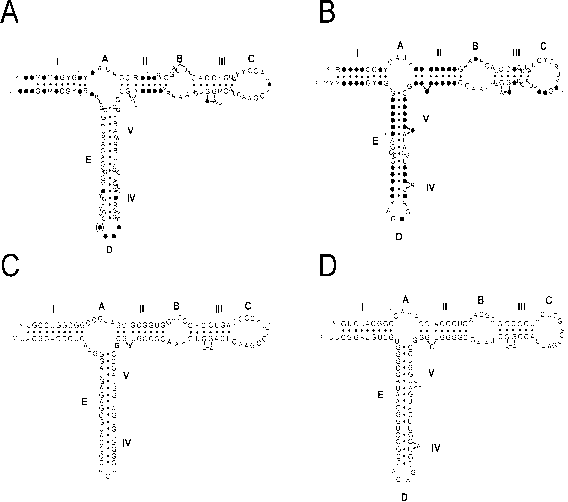 A general model for the sequence of events during the cap-dependent formation of the initiation complex with participation of mRNA-binding initiation factors. A designates eIF4A, B - eIF4B, E - eIF4E, and G -eIF4G. The consecutive steps from (1) to (6) are explained in the text. (translated) globin mRNPs, and no eIF4E was detected in free non-translated mRNPs. The eIF4G (the p220 subunit of eIF4F), as well as eIF4B, were repeatedly reported to be localized in ribosomal particles fraction. It is noteworthy that eIF3 is capable of forming a complex with the whole eIF4F, and the eIF-G subunit (its C-terminal portion) seems to be responsible for this complex formation. According to the model depicted in Fig. 15.13, the whole eIF4F(aPg) first binds to the cap structure, then eIF4B comes and induces eIF4F-catalyzed unwinding of cap-adjacent hairpins on mRNA, and then free eIF4A or eIF4F start to interact with mRNA and eIF4B thus catalyzing further unwinding of downstream hairpins. Ribosomal 43S initiation complex lands on the unwound region of mRNA in the vicinity of initiation codon. This is the "classical" model generally accepted. An alternative model seems to be physically more probable under physiological conditions: eIF4E is retained at the cap-structure in translatable mRNPs, while eIF4G (p220 subunit of eIF4F), as well as eIF4A and eIF4B are in association with the ribosomal 43S initiation complex; seemingly, the eIF4G is complexed with eIF3 on the 40S subunit. In such a case it is the 40S ribosomal subunit carrying also the mRNA-binding initiation factors that lands on the cap-structure and uses its associated ATP-dependent helicase activity to move downstream towards the initiation codon (Rhoads, 1991). Thus the ribosomal initiation complex labilely associated with the components of eIF4 (see below, Fig. 15.16) may be considered as an mRNA-binding and mRNA-unwinding machine landing on and moving along mRNA as a whole. In addition to the full set of conventional initiation factors, including eIF2, eIF3 and eIF4F, the cap-independent initiation at the internal ribosomal entry site (IRES) seems to require special IRES-binding proteins. At least two cellular RNA-binding proteins, p52 and p57, can be mentioned as the factors involved in IRES-dependent translation of picornavirus RNAs (Jackson, 1996; Ehrenfeld, 1996). p52 is the protein capable of specifically binding to the downstream (3'-proximal) portion of the poliovirus IRES and providing for the stimulation of the translation initiation at the correct site of the polioviral RNA and the suppression of initiation at incorrect sites. The protein has been found to be identical to the human La antigen earlier detected by antibodies from some patients with autoimmune diseases such as lupus erythematosus. As an RNA-binding protein, it contains a characteristic RNA recognition motif of the so-called RNP-1 type. In normal mammalian cells the La protein is localized predominantly in the nucleus where it may be involved in the maturation of RNA polymerase III transcripts. At the same time, a fraction of the La protein has been shown to reside in the cytoplasm. The virus infection, in particular poliovirus infection, induces redistribution of a significant portion of the La protein from the nucleus to the cytoplasm, and in this case it comes out as a translation factor for poliovirus RNA. An important question is whether the La protein, or p52, is a translation factor for all picornavirus RNAs, or its role is more limited and relates just to enterovirus IRES activity. p57 is another RNA-binding protein having specific affinity for IRESes of seemingly all picornavirus RNAs. The protein is found to be essential for the initiation of translation of picornavirus RNAs. It seems that the protein binds to multiple sites in the picornaviral IRES, thereby stabilizing a specific active conformation. Again, like in the previous case, p57 has proved to be identical to a nuclear protein, earlier known as "polypyrimidine tract-binding protein" (PTB) that binds preferentially to the polypyrimidine tract near the 3'-end of introns of pre-mRNAs. The protein belongs to the family of RNA-binding proteins with four RNA-binding domains (RBD), but lacks the typical RNP-1 and RNP-2 sequence motifs. It has been localized in the nucleoplasm of interphase cells. At the same time the protein can be detected in the cytoplasm and even in the ribosomal fraction. No information, however, is available about the participation of p57/PTB in internal initiation of cellular mRNAs. The indications on the participation of other RNA-binding proteins, such as p38 and p97, in the IRES-dependent initiation of translation have appeared. Generally, the situation with the interaction between different IRES-binding proteins and the contribution of each of them into the internal initiation process is not yet clear. At the same time, up to now no universal factor essential for internal initiation on all IRESes has been found. This suggests that the role of different RNA-binding proteins specifically interacting with different IRESes may consist in stabilization of the IRES structures, rather than in direct participation in the internal initiation process. One of the most remarkable features of eukaryotic translation is that it can be stimulated by some elements of mRNA located far away from the initiation site, particularly in the 3'-untranslated region (3'-UTR). The best known and most universal translational enhancer of eukaryotic mRNAs is their poly(A) tail (for review, see Jacobson, 1996). The enhancing effect of the poly(A) tail is realized through the stimulation of translational initiation in some unknown way. The enhancement strictly requires the presence and multiple binding of the poly(A)-binding protein (PABP) to the poly(A) tail. There is a hypothesis that the poly(A) tail/PABP complex plays the role of an enhancer of translational initiation by directly contacting the 5'-portion of mRNA. The enhancement has been supposed to be exerted by the tail-bound PABP which facilitates the joining of the 60S ribosomal subunit to the initiating 40S subunit complex (48S complex). Also the cap function was shown to be enhanced over an order of magnitude by the presence of a poly(A) tail, and the poly(A) tail-mediated enhancement of translational efficiency was reported to be strongly dependent on the presence of the cap structure. More recently poly(A) has been shown to attract the cap-binding initiation complex, eIF4F, together with eIF4A and eIF4B, thus suggesting the idea that the initiation factors complex may be compartmentalized on the poly(A) tail and then, during initiation of translation or reinitiation, transferred to the cap structure of mRNA, possibly with the participation of PABP. All this implies that the poly(A) tail and the tail-bound PABP must be in proximity to the 5'-UTR of mRNA in the translating polyribosome (Fig. 15.14). Indeed, there are several electron-microscopic indications that many polyribosomes in eukaryotic cells have a circular organization (see Fig. 4.5). 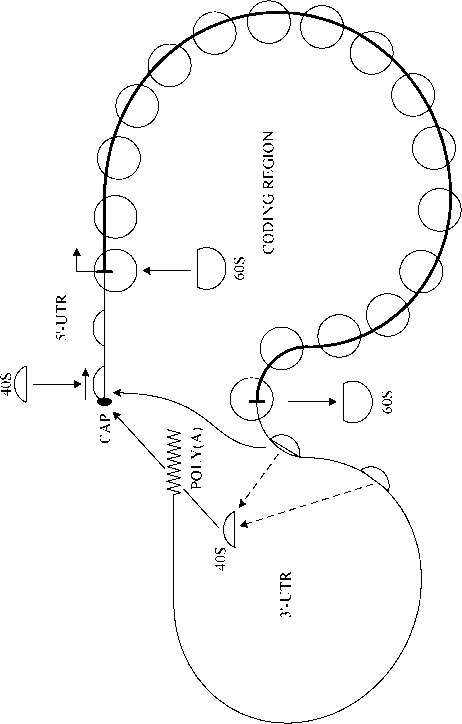 Along with the possibility of translational enhancement via poly(A)/PABP-mediated tail-to-head interaction in mRNA (Munroe & Jacobson, 1990), the second possibility can be considered that the multimeric poly(A)/ PABP complex exerts a general conformational effect on translatable mRNP (Spirin, 1994). The effect can be realized through the maintenance of a more open and admissible conformation of mRNP, rather than through local interactions. Consequently, the longer the poly(A)-tail, the more PABP molecules are cooperatively bound and the better is the stabilization of the global translatable conformation of polyribosomal mRNP. A group of translational enhancers of a more specialized type includes pseudoknot domains and tRNA-like structures at the 3'-UTRs of plant virus RNAs. These RNAs are not polyadenylated, and the 3'-terminal pseudoknot domain with the tRNA-like structure (Fig. 15.15) substitutes for a poly(A) tail as an enhancer (Gallie & Walbot, 1990). Moreover, when the pseudo-knot and tRNA-like structure-containing 3'-UTR of plant virus RNA was fused to a coding region of a foreign reporter mRNA, it exerted the enhancing effect both in plant and animal cells (Gallie et al., 1991). Again, like in the case of poly(A) tail, the synergism was observed between the 3'-UTR structure and the cap structure (Leathers et al., 1993). The fact that the enhancing effect of the plant viral RNA 3'-UTR is displayed in the mammalian cell cytoplasm, as well as in the plant cells, suggests the involvement of a ubiquitous RNA-binding factor, but probably different from PABP. Figure 15.14. A model for the enhancing effect of poly(A) tail on the cap-dependent initiation of eukaryotic mRNA translation. Consisting with the circular organization of eukaryotic polyribosomes, the poly(A) tail complexed with PABP can be in contact with the capped 5'-end of mRNA and serve as a recruiter of free ribosomal subunits and RNA-binding initiation factors (including eIF4E and eIF4F) for the cap structure. (D. Munroe & A. Jacobson, Mol. Cell. Biol. 10, 3441-3455, 1990; D. R. Gallie & R. Tanguay, J. Biol. Chem. 269, 17166-17173, 1994; S. Z. Tarun & A. B. Sachs, Genes Dev. 9, 2997-3007, 1995).